ale wiocha, lepiej wjebać tam porządny laser i można robić laminaty, amelinum i inne materiały. Hey very nice writeup. Before I had built my own 300mW powered laser cutter I always wanted to know what it actually can cut/engrave. Actually wanted to create a similar writeup as you did here so wonderfully, so thank you for this 🙂 ! You know, your ”frankengraver” was studied in detail before I started to build mine so I guess that you should also have credit as well as groover for his instructable. So thank you for showing your build and inspiring me. I actually went though two old inkjet printers and a scanner in the hunt for good stepper motors before I just decided to take the cost for buying new ones. HP has started to use normal DC motors and then have a translucent strip with black marks on that is read by a photosensor to determine position. Could you please give some more information on the laser? What pins to use, how diid you adjust the power module, and what voltage didi you use for example. Sure, I will update the post with that info as soon as I have time. Hopefully tomorrow. I have now updated the Laser heading in the Hardware part of the post with some more information regarding the power supply. I hope it was what you were looking for. Can you recommend any eye protection for lasers like this? I’d like to build a similar cutter/engraver, but I’m worried I’m going to damage my eyes. I bought the ones from dragonlasers that I mention in the hardware part of the blog post. They seem to work fine. I’m not really an expert on laser protection glasses so what is in the post is what I know. Thanks for your fast reply., I really appreciate it. I just ordered the laser parts, it will take few weeks to them arrive to here. But when I get my cutter ready, would you like to see some pictures? I basically have the frame and the electronics allready done, just the laser missing. But the problem I am having is that when I try to print a test file I made with incsape, it prints it so darn small! What could be causing this? Perhaps you have set the wrong number of steps for your stepper motors in the grbl config file. If you are using motors with 200 steps per revolution with easy driver stepper motor drivers the easy drivers supports something called micro stepping which makes divides every step into 8 micro steps. If you have it setup like this so you should set the grbl config as if your motors had 1600 steps per revolution. The stepper motors do have a peculiar sound sometimes like they groan but that is perfectly normal. Could you please link me, what laser housing did you use? I got the laser parts today, and did my best trying to focus the laser. I did not get the laser to burn, it didn’t make a paper even hot! I thought that the problem was in my multimeter, and I increasend the voltage. Eventually I ended up frying the laser module. Also, how didi you messure the current? Did you put the laser module in series with the multimeter, or what? I am very sorry to hear about your misfortune with the laser diode, it is really annoying to have to wait for new components again. But the best way to learn is from your own misstakes. This is the housing I am using: http://www.ebay.com/itm/660nm-5-6mm-Laser-Diode-Module-Host-12mmx30mm-Aluminum-Host-w-h-Heatsink-Lens-/111121558113? If you are going to test the laser I would recommend using some kind of plastic, like electrical tape rather then paper. Also use a dark color but preferably not red since that will reflect almost all laser light since it’s the same color as the laser. The only paper I can cut is thin black paper. To measure the current you put the multimeter in series with the laser. I run my laser at around 2.4V. I haven’t measured how much current it actually draws so I can’t tell you that. I have set the current limiter on the laser power supply to 400mA and that is not kicking in so I know it’s using less then 400mA at least. The housing you linked isn’t available anymore. I was wondering, if I could use 650nm hoising? Does it matter that mutch? I am going to test with black tape next time, thanks for the tip! I messured the current ike that, so I must have gotten that right. The seller I linked to usually has the 660nm in stock, I would send him a message and ask if he will get them back in stock soon. I don’t know if the 650nm will work just as well, perhaps you could ask the seller that to. Based on what he is selling he should know. I found a little more powerfull laser module that was 650nm, so I ordered the 650mm housing and laser module. Now it is just wating again. Looking forward to hear about it! Good luck. 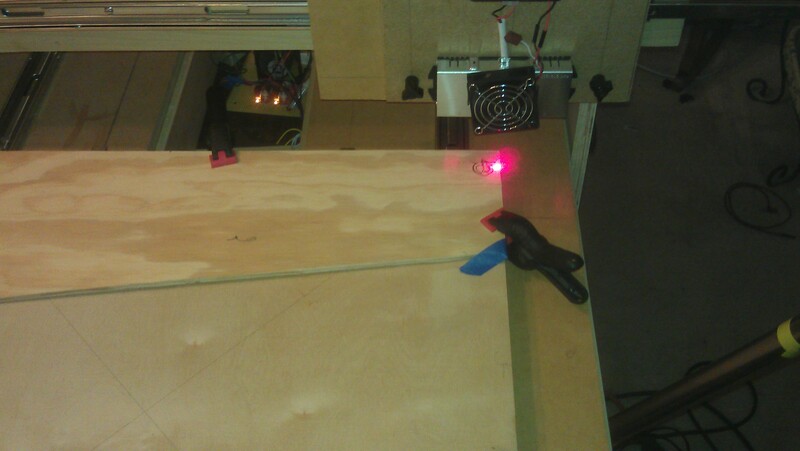 How did you decide upon the height of the laser above the work surface? I think you may get better stability if it is closer or is this the closest height you could focus the laser? I didn’t give it much thought at the time I was building, I made it a height where I could easily work with the material I wanted to cut without the laser being in the way. Stability wise I wouldn’t say that the height the laser is at currently is a problem, the frame is quite rigid and the forces involved are quite limited. However I might have gotten more ”cutting power” if the laser was closer to the material that is being cut given that it could be focused. LM2596S DC-DC Step-Down power supply – I seem to be having a providing the laser enough current. I have tried a 12 and 18 volt stepped power supply (leftover from dead laptop). I can get the voltage to the correct level < 3v, but cannot seem to get the current more than 260mA. The laser diode says <340mA. While it lights, it will not burn. I get the same result with or without the laser diode in the circuit. Is there a problem using stepped power supplies with this? As I understand it the amount of current the laser diode will use is in direct relation to the voltage. If you keep the voltage to under 3V then your laser will only use 260 mA, if you increase the voltage the laser will draw more current but it will also burn out very quickly. I think my laser uses around 250 mA as well, I fried one other laser diode with to high voltage when I tried to get the current up just like you so be careful. My laser burns well with just 250 mA so I would rather suspect your optics then the diode it self. What optics are you using? Have you tried to focus the laser? I used a peice of black plastic when focusing the beam since it was easy to see when it started to smoke. I haven’t tried to cut overheads yet. If I just look at the laser in the video it looks very similar to mine, just judging from the light intensity. I am certain that you will have to color it black as is done in the video though, otherwise the beam will go right through without affecting it. I will try to remember to pickup some overhead transparencies next time I’m at the store and let you know. I have been trying to find some overheads but they are not easy to find these days. As soon as I find some I will try it out. Hi, of course I can send you a gcode file I know works. Send me an e-mail at jenslabs@gmail.com. Can you specify a little bit more what kind of problems you are having with the gcode files you create. I have had problems where the laserengraver plugin adds a blank line in the beginning of the gcode file which has to be removed before the gcode sender can use the file. What speed are you running your motors, I have found that for cutting eva foam and adhesive plastic that a speed of 60 is good, and for burning wood I use slower speeds around 30-40. I was all set, and burned another laser diode, while trying to focus it. Arrgh! How did you get the beam into focus? I am using the same housing as you do, but the beam is still very wide. I can’t get the beam to a nice little spot as it should be.. I so sorry to hear that! Can you describe what you mean by ”burned” the laser. Did is stop working all together? If so have you made sure that the voltage isn’t to high, it should be around 2 volts. I didn’t do anything special when it comes to focusing the laser. After I had mounted the laser in it’s housing i used a flat screwdriver to rotate the laser lens into position. The metal ring that you are supposed to use when focusing was a bit loose and I could only use it for fine tuning. The method I used was very simple. Look at the dot and twist the ring until the dot is a tiny as possible. Really nice work! Do you know if this laser would cut through 3-5 cm soft plastic materials like polyester foam? I’m thinking about making my own cutter for storing miniatures. Sadly I suspect that it will not be strong enough for that. Perhaps with a 2-3W blue ray burner diode it might be possible. Thank you for your quick answer and the tip regarding the blue ray diode. I’ll look into that. What are the dimensions of the boards you used on this? Width & height wise, im just trying to get a feel for the size of this thing. The work area is about 20x20cm. The whole machine is prehaps 35x35cm. I was wondering if you have tried anything with glass? Maybe if it was painted with a very light coat of flat black paint first it might work, thoughts? I was just trying to think of a way of pulling it off. I built a vey small machine just to play with, but will be making the guides and flat bed much larger very soon. 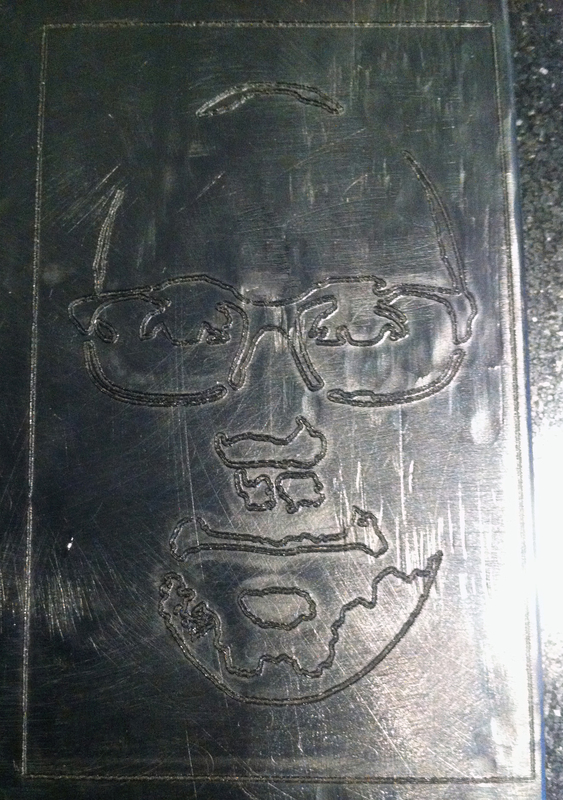 I have not tried to etch on glass. I suspect it will be difficult. You most definitely need to add some kind of coating of paint that the beam can focus on. I think that a best case scenario the paint might bind to the glass but more likely the laser will not effect the glass at all. I will give it a try next time I run the cutter. If you do any experimenting on your own I am very interested in your results. Good luck. i have used a 1w blue laser to etch black glass from my welding mask. it doesnot melt the glass so much as superheat the dye in the glass and explode tiny fragments off the surface. it can do very fine work and fast. Hi, can you cut through 4/5 mm cardboard ? I think that it probably wont work. It can cut thin plasticard but cardboard seems to be more resistant to heat then plastic. Can you describe your mechanical connection between the stepper motor and the threaded rod? What did you use to connect the 2 together? I used flex couplers that I bought from ebay, e.g. http://ebay.to/1wgxwEc. They come different sizes so make sure you buy ones that fits your motor shaft size in one end and the threaded rod dimension in the other. Thank you thats what I was looking for. Always happy to help. If you want to go low-tech a soft rubber hose and some zip ties can be used but you will risk that the motor shaft starts slipping when the motor runs fast. Can you tell me if your machine can cut a Printed Circuit Board (PCB), used in manufacturing electronic devices? Man, have you tried with cooper pcb? To create Printed circuit boards? I have tried but it doesen’t work. ok thanks, maybe with a 2000mW, If I get one I’ll try. Regards! Could you upload a schematic of your electronics connections? I’m interested in the connections of the mosfet with the LM2596 and the laser. What resistor values did you use? Did you use any high power resistor? 2) Current measurement is unclear to me since I do not want to fry my laser. Do you short the driver and measure the current flow? Or do you attach the meter with your laser diode? 3) You say you modulate on / off with a MOSFET. What kind? Do you put the mosfet on the laser output? 4) I have a TTL capable driver. I suppose I could turn the laser on and of using the Arduino pin? I did as you say, just shorted the drivers outputs with the multimeter in current measuring mode. Then I adjusted it to what I thought was a good max current, nothing fancy. I used a logic level mosfet, I think it was an irl540, since I didn’t have a driver board that was prepared for input. I agree that you probably just need to connect the on off pin from the arduino to your driver. Hi, sorry if someone might have already asked this question, this post is from 3 years ago… But can you use it to engrave pcb? Actually not directly laser on copper, but you can spray some thin black paint over the board, and then remove the paint using the laser, to etch the board later. Have you ever tried this? Please let me know if it works, I’m really interested in doing it. I have actually tried it and the laser is to weak to even mark the copper even if painted black. It is possible to do it with a more powerful laser I think.